$26,000 in scholarships over the past 6 years. Scholarship graduates include: 2 University , 1 Teacher's School, 1 Sustainable Agriculture, 4 middle school. Established local scholarship advisory board. Raised educational expectations in Banaka and Las Marias among parents and students. 2 additional scholars continue progress towards high school degrees in Trujillo. Total number of donors increased from 12 to 34. The Río Plátano Biosphere Reserve is an international Man and the Biosphere Reserve and World Heritage Site and one of 35 sites in the world on the List of World Heritage in Danger. The 815,000-hectare Reserve is the largest protected area in Honduras and part of the largest contiguous rain forest in Central America. Almost nine-tenths of the Reserve are intact, not yet having experienced the deforestation, intensive farming, over-exploitation of fish and wildlife, and human population growth that has damaged much of the region. 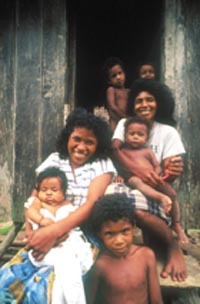 The Reserve is inhabited by five peoples: The indigenous Miskito, Tawahka-Sumu, and Pech peoples, the ethnic Garifuna who settled the region in 1797, and Ladinos who settled the Reserve during the past 80 years. These peoples number about 20,000 persons in the Reserve. Traditionally, they have subsisted by gardening, hunting, and fishing. However, traditional activities in the Reserve have increasingly given way to a variety of economically transient and destructive land uses. Timber, agriculture, and cattle operators continue to deforest the Reserve. Gold miners contaminate the Patuca and Plátano Rivers. Armed intruders evict traditional inhabitants and promote environmentally destructive and illegal acivities. Villagers cut mahogany trees for foreign furniture makers and work on foreign owned lobster and shrimp boats. The human toll from these changes has been tragic. Hundreds of villagers have been killed or paralyzed in scuba diving accidents while working on the lobster boats. Traditional social controls have been weakened by alcoholism, drug abuse, economic disparities, and domestic violence. The ethnic and indigenous peoples of the Reserve want to maintain their traditional norms and land uses, but feel powerless to control these changes and confront the threats to their livelihoods, culture, and homelands. We believe that education is a critical component in an overall strategy to protect these peoples and the biological diversity of the Río Plátano Biosphere Reserve. To enhance the conservation and sustainable development prospects of the greater Río Plátano Biosphere Reserve through the collaborative development and provision of enriching educational opportunities for the indigenous, ethnic and resident peoples of the region. School children in Las Marias. Conservation without strong human capacity is a short-term measure to address a long-term problem. Experience shows that the most environmentally active individuals in rural Latin America are those with a high school education or better. Godoy et al. documented the important role of formal education in reducing neotropical deforestation, and Greenquist and Boxer-Macomber reported the importance of education in sea turtle conservation projects within the Reserve. But educational quality and opportunities are limited in the Río Plátano Biosphere Reserve. We believe better educational opportunities will lead to improved conservation. We work exclusively in the Río Plátano Biosphere Reserve located in the northeast of Honduras. See maps. It is a region of extremely high biological diversity and has also been designated a World Heritage Site. To learn about the Río Plátano Biosphere Reserve click on "Río Plátano" above. Our work is based on the principles of volunteerism and local involvement. Our organization is made up entirely of volunteers, most of whom are Río Plátano residents. This allows us to dedicate nearly 100% of our resources to project completion. Also,we are fortunate to benefit from a partnership with MOPAWI, the leading conservation & development organization working in the Río Plátano Biosphere Reserve. We would like to extend a heartfelt thank you to all those donating in the name of Sven Greenquist.